I grew up in a small Florida town and could only dream about leaving and moving to the city which I ultimately did when I left for college. When I later married an Ohio farm boy and had three children it became ironic since all we can dream about now is moving back to the country to raise our family. 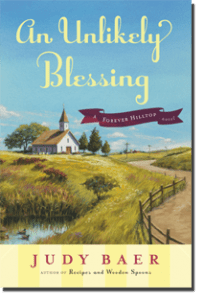 An Unlikely Blessing: A Forever Hilltop novel by Judy Baer is the story of an urban professor who moves to a very small town in the plains of North Dakota to take on his first assignment as a new pastor to two separate churches. An Unlikely Blessing is a lovely story that has a rich cast of characters residing in the town of Hilltop. Every evening when the kids were in bed, I immediately grabbed this book to continue reading….it is a novel that is full of warmth, faith and evidence of God’s mysterious ways. The main character, Alex Armstrong is at a cross roads when he makes the life altering decision to take a new job as a pastor and encounters a township of people that are struggling in their own lives. The author so successfully develops the characters that at times I had to remind myself that this was a novel. The inter-connected stories and personal struggles of the characters were thought provoking and heartwarming. I also appreciated the humor and attention to detail that the author incorporated to make this a truly entertaining story. I loved the way that the author also includes recipes into the novel that were introduced by a particular character in the story, particularly “Lydia Olson’s Apple Crisp” which I made for my family and was absolutely delicious. This is the first work that I have read by author Judy Baer but it won’t be the last…..in fact I suspect (and hope) that this will become a series because I would like to find out what happens next in the town of Hilltop. The author has written over 70 books and I can’t wait to read more as I thoroughly enjoyed An Unlikely Blessing. You are invited to learn more about the author on her website. This sounds like a great read! Perhaps similar to Jan Karon’s series, first novel At Home in Mitford? Thanks for the contest.